I was first introduced to Bill Eddy’s approach to understanding and managing High-Conflict people in 2008 when the Family Section associated with the Denton County Texas Bar Association sponsored a three-day live seminar/workshop presented by Bill Eddy on understanding High-Conflict people. There are literally hundreds of books about how to deal with difficult people, but few that explain how to easily recognize a High-Conflict Person (HCP), and fewer still that focus on advanced, simple and repeatable skills that allow the application of these principles and techniques that enable the management of the HCP’s abusive negative emotions, blaming and personal attacks that can easily “hook” the unsuspecting professional into a quagmire of manipulation and misery. My favorite books to recommend are: It’s All Your Fault: 12 Tips for Managing People Who Blame Others for Everything and BIFF: Quick Responses to High Conflict People. Both are excellent at providing an understanding and command of the subject – with each read, you gain more competence and ease of using Bill Eddy’s methods. I use the principles of the “E.A.R.” method and the “BIFF” method in my interactions with people on a daily basis. 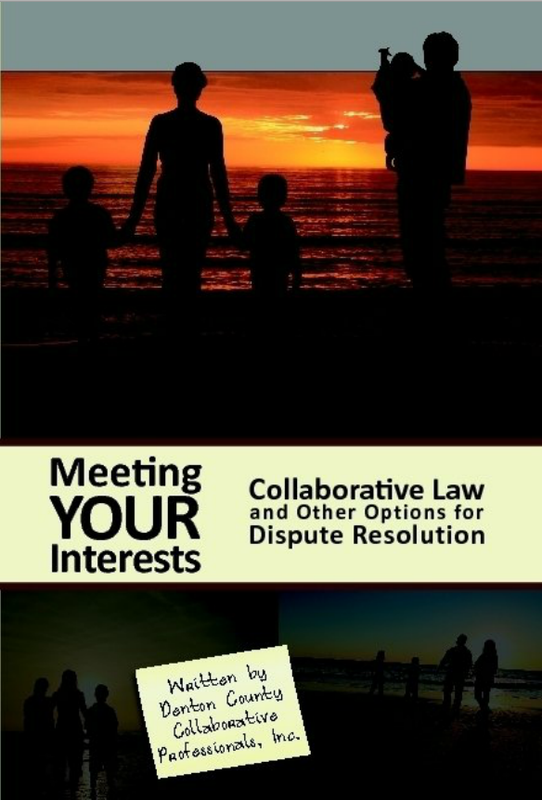 Perhaps the most unexpected thing that I learned from Bill Eddy was that, in addition to clients, many other professionals involved in litigation cases, such as opposing attorneys and judges, can be High-Conflict personalities who can to draw you into their dysfunction and make your client’s case more difficult and your life miserable. Bill Eddy also taught me to recognize and manage people who Bill terms as “negative advocates,” people who are best described as persons who support the negative behavior of HCPs, many times unwittingly and almost always in a manner that is uninformed, disruptive and unproductive. By applying Bill Eddy’s principles, you can master the art of screening people you now will recognize as too disturbed or too much trouble, and how to manage expectations of clients you decide to accept, and resist the escalation of disputes that are non–productive. I am looking forward to learning the 4-step structure and skills for reducing conflict that the New Ways for Families Training promises. Most attorneys and mental health professional are familiar with Bill Eddy’s books and in-person presentations and seminars. Bill Eddy is an attorney, therapist, mediator, and the President of the High Conflict Institute based in San Diego, California. Mr. Eddy provides training to professionals worldwide on the subject of managing high-conflict personalities and the New Ways for Families method. 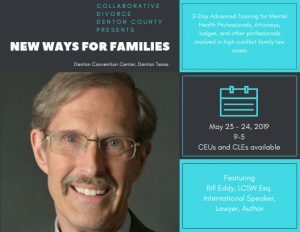 Collaborative Divorce Denton County is presenting a full two-day training focusing on advanced skills for professionals dealing with high-conflict people as individuals or when involved in family problems, especially separation and divorce. This two-day training is required for counselors providing the New Ways for Families method, and is also recommended for lawyers and judges. This training will also emphasize a greater role for clients by using simple decision-making skills which are taught and reinforced by the mediator, including through Pre-Mediation Coaching. Professionals do not need to be involved in New Ways for Families to benefit from this two-day training. Feedback and questions about procedures from participating professionals will be encouraged and adaptations will be discussed. This powerful training comes to Denton in May, 2019. Learning from this world renowned expert on managing High Conflict Personalities and changing how we deal with these families can transform your practice as an attorney, as a mental health professional, and as a professional in general. Sign up before the early bird registration closes.